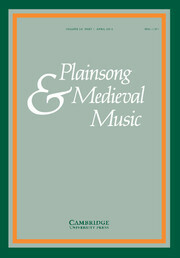 Published twice a year by Cambridge University Press, this journal covers the entire field of plainchant and medieval music. It encompasses Eastern and Western chant, secular lyric, music theory and paleography, performance practice, as well as medieval polyphony, sacred and secular. The chronological scope extends from late antiquity to the early Renaissance and to the present day in the case of chant. In addition to articles embodying original research, the journal publishes book reviews, a list of important recent publications, an annual bibliography of chant research and an annual discography of chant recordings. Complete listings can be found on the Cambridge University Press page. The editors of PMM have received a communication from Robert Mullally about the review of his book The Carole. Click Mullally reply to review to read it.